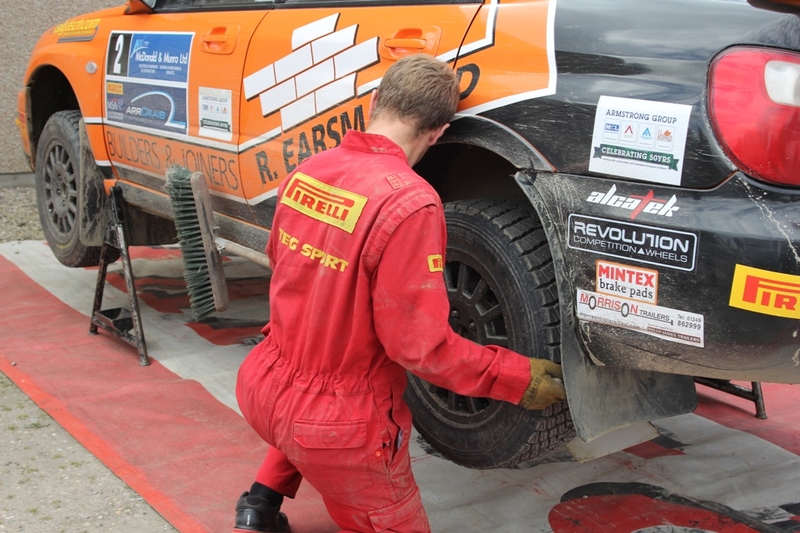 The sport of rallying is a most complex affair especially when it comes to cars, their preparation and the tools of the trade. Keeping up with electronic and engineering progress is a non-stop endeavour and not just for the manufacturers of such vehicles, but those who prepare, maintain and service these intricate mechanical beasts on events. Speed and efficiency are of the essence here, hence the need for specialised tools. Equipment which can be deployed in an instant and deliver precise engineering measurements on which dedicated teams of technicians can make judgements about what needs to be done. One such device was spotted at the Speyside when Jock Armstrong came into service and asked the TEG Sport boys to check out the rear end. He thought it was "a bit loose" having been ever so slightly off the road. The boys swung into action with their precision made tools and diagnostics and having checked out the diff and suspension turned their attention to the tracking. At this point, the latest tool in the arsenal of the rally mechanic was whipped out the back of the van and pressed into service. This purpose made device is made from recyclable materials, self-powered, light in weight, quick to calibrate, easy to handle and a doddle to measure with. It even has a tufted pad at one end to wipe the mud off the wheels before application thereby ensuring absolute accuracy in use. However, the tool does come with a warning. Keep away from dry rot and woodworm or this will invalidate the warranty. Also it must not be loaned to non-trained personnel who possess a naturally tidy mind and may find other uses for such a tool - especially if the kitchen floor is dirty. I tried to question the TEG boys about this latest 'tracking tool' and where it had been sourced, but my enquiries were brushed off.